Stokke Stokke Steps Bouncer in Pink by Stokke at Baby Bouncers & Swings. MPN: 483203. Hurry! Limited time offer. Offer valid only while supplies last. From the manufacturer's: The softly cushioned bouncer has a unique cradling movement that mimics the feeling of being cradled in mothers arms. From the manufacturer's: The softly cushioned bouncer has a unique cradling movement that mimics the feeling of being cradled in mothers arms. 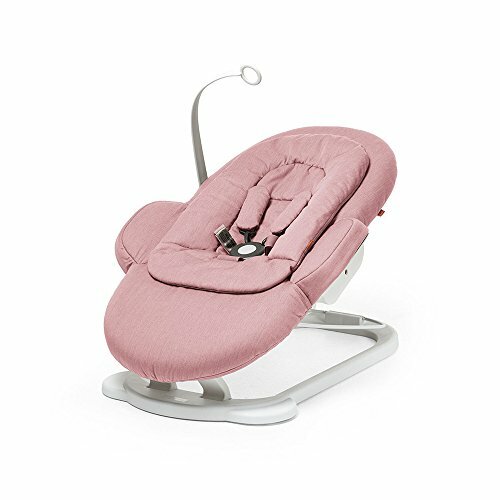 Developed together with a Paediatric Physiotherapist, our Newborn Insert ensures that your newborn baby will be properly supported when placed in the bouncer. The detachable toy hanger keeps your little one´s favourite toy close at hand.